Nuke’s default scanline render can be really slow to me IMHO. So whenever you need to arrange maybe a few cards in a shot, I highly recommend using Card3D instead. The difference that I know is that Card3D can’t interact with other objects in Nuke 3D scene (this is where the regular Card node is actually an actual geometry unlike Card3D). 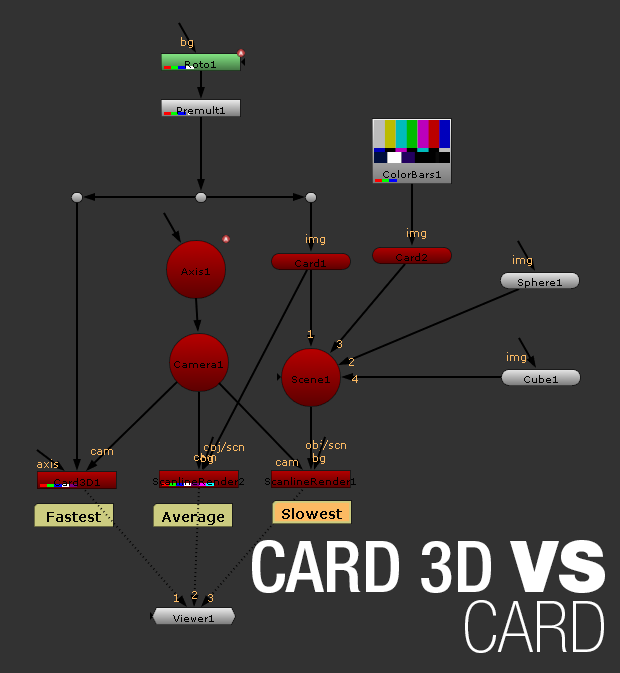 Even though it can’t interact with the 3D scene, the benefit is Card3D renders much faster compared to ScanlineRender. So if you need to speed up your overall rendering speed, I suggest using Card3D instead of regular Card with ScanlineRender. Whenever we can reduce render time, I say it is useful to convert select element from Card to Card3D if you can get away with it (subject to your supervisor approval if working in a studio). Since talk is sweet, here’s the sample script which I created to demonstrate three different scenario. Make sure to cycle between all three with the cache clear in between session for accurate performance. note_font "Verdana Bold Bold Bold"